Hi everyone. Today's card is the this week's Color Challenge at SCS (CC430 - Pear Pizzazz, Old Olive, Daffodil Delight) ... or the closest colors you have. I am loving the new Pear Pizzazz ... it's not new, new ... it was an In-Color, but has returned to SU! as one of the new permanent colors, so I bought the paper, ink and pen and am ready to go! I also used washi tape on this card ... although it just looks like a strip of yellow gingham paper (with the sentiment stamped on top). I could have used the same paper as the sunflower, but the washi was handy ... love how it adheres so easily and also easy to reposition if you make a mistake (bonus!!). After making the main panel, I was going to just pop it up on the white card base, but really felt it needed something more. So I added a 1" strip of Old Olive just under the bottom of the main panel to ground it. I like how it turned out ... it's just a little different. Hope you like. The sunflower is two layers of yellow gingham, with the top layer shaped with the stylus and mat . 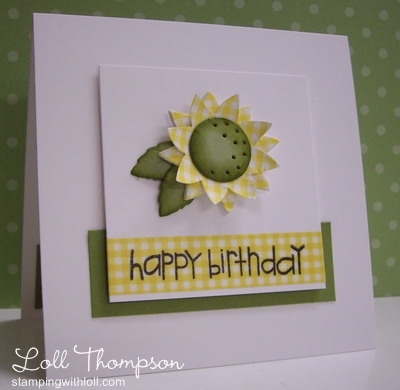 The center is cut from Pear Pizzazz cardstock (as is the leaves) and the edges are sponged with Old Olive ink. The center is also shaped with the stylus and mat and the popped up in the center of the sunflower. Loll that flower is absolutely adorable! I guess we both were into yellow gingham today!! Putting that strip of Olive behind the sentiment was brilliant! And the random piercing on the center of the flower is too! You've taken a very simple card and made it a WOW creation! You are enjoying that plaid! I am too. Love it and you should take credit for that! Very sweet card, I love the plaid!! Wonderful job loll. This card is gorgeous Loll. 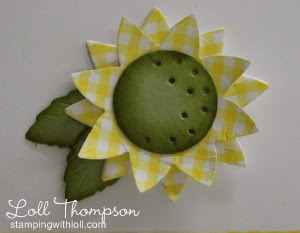 Love the fresh, crisp colours and that sunflower is gorgeous. That sunflower is so pretty, Loll! And the strip of old olive definitely adds to the design.